Rigid hot dipped galvanised steel construction. Compact unit with a slim configuration. Fits through standard sized door frames, making it ideal for indoor storage areas and secure collection areas. 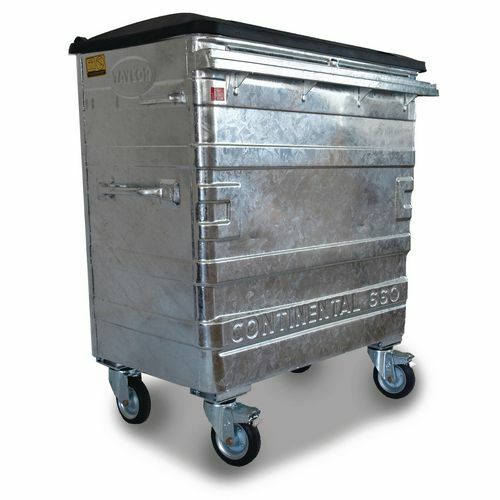 If you are looking for a wheelie bin with outstanding corrosion resistance suitable for indoor or outdoor storage areas, these are the ideal bins that will withstand the test of time.&edsp;&edsp;Our bins are made from hot dipped galvanised steel and have internally welded seams, both of which help prevent internal and external corrosion. An added bonus for this type of material is that it is resilient to vandalism, so its appearance will remain neat and tidy wherever it is kept. The corrosion resilience gives our bins an advantage above the others as it makes the products low maintenance for their life spans, as well as giving complete protection for the underlying cold steel. 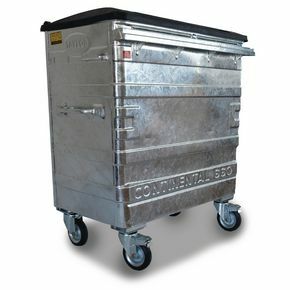 The easy to lift lid allows for swift waste disposal and they hold 1100L of rubbish when at maximum capacity. Our bins meet EN840 standards and their 4 castor wheels make them glide smoothly from place to place when they are moved. A handle on either side of them assist you in pulling or pushing the bins into position when required and they fit through standard size door frames, allowing them to be easily kept in indoor storage areas and secure collection areas. Our bins also come with a whopping 60 months guarantee.